Review: another fab novel from Jane Costello. What I love about books by this author is that they are so true to real life, you could imagine all of the events in this book happening to you and you know you wouldn't find them funny but in these books they provide you with unlimited belly laughs. There was quite a few occasions when I was reading this book that I was asked why I was laughing and then I had to tell people about the book-so much fun! The characters in this book are relatable as well. I really felt for Dan and Gemma trying to find their perfect house and the endles searching and hoops they have to jump through, whether you've ever searched for a property to rent or to buy you will be able to relate to things they are going through at everything dates of this novel. I have to admit that the whole house buying scenario really did stress me out in parts but it provided hilarity as well! I have to say that I liked Dan a lot more than I liked Gemma, I know I shouldn't pick favourites but... I loved how optimistic dan was. Gemma had her sights set on her house and was willing to do anything to get it. She also didn't treat dan with enough love and respect as I thought she should because dan was lovely. Dans mum plays a massive comedy part in this novel and I really warmed to her even though she did stop dan and Gemma from living like a normal young couple, she really wanted what was best for her son and her duaghter in law. Dan is also very close to his grand more which I thought was a refreshing part of the plot and something a little different from a lot of novels in this genre. Dan and Gemma's friends also provide some comedy moments throughout the story and their little sub plots run alongside the main plot very happily but are still strong storylines themselves! Although I did find parts of the novel stressful I still really enjoyed this book. I thought the pace was a little slower than other Jane Costello novels I have read in the past but it is still of the same calibre that I expect from this fab novelist! 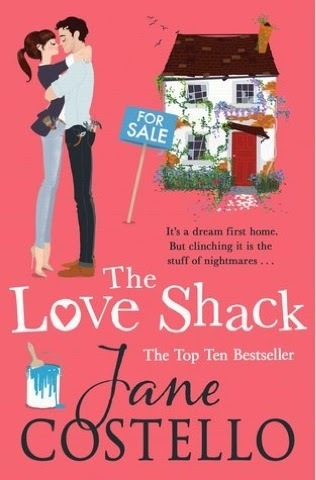 Whether you've read anything by this author before or not The Love Shack would be a great place to startup, and if you're a veteran fan like myself, you won't be diaspointed!